For a unique night out in New Zealand, spend an evening watching little blue penguins come ashore on the Otago Peninsula. 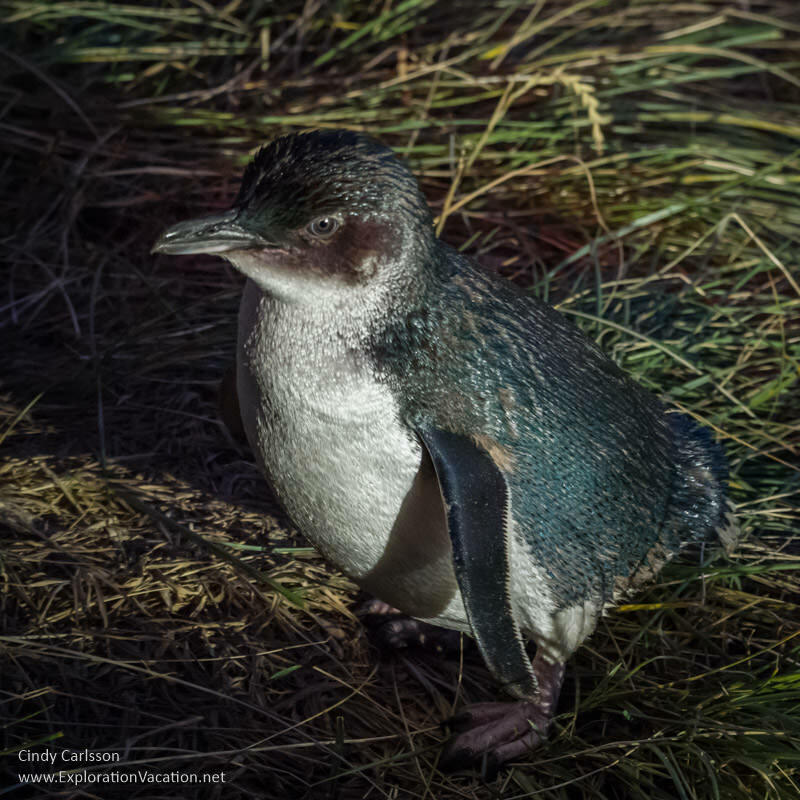 Visitors to New Zealand can generally plan to see three types of penguins: yellow-eyed penguins (hoiho), Fiordland crested penguins (tawaki), and little blue penguins (kororā). However, visitors are most likely to see little blue penguins, as they breed in large groups and are the most common penguin in New Zealand. Officially known as little penguins, they are also called blue penguins, little blue penguins, and – in Australia –fairy penguins. All of these names are relatively descriptive, as the diminutive penguins are the smallest penguins and have dark feathers with a blue sheen. Extending out from the city of Dunedin, the rocky Otago Peninsula is home to several penguin colonies. Like little blue penguins throughout New Zealand, the Otago Peninsula’s penguins spend the day at sea and return to land only after sunset. Even when nesting, one penguin will stay hidden inside the nest during the day while the other is out at sea feeding. This nocturnal activity makes it hard to see little blue penguins in the wild. 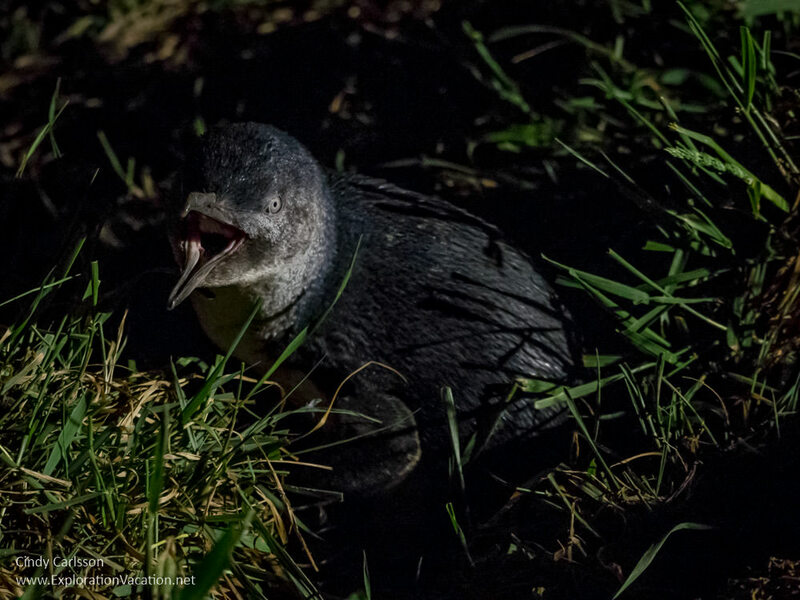 On the Otago Peninsula this difficulty is addressed through a viewing platform and special lighting that allow visitors to watch the Pilots Beach colony of blue penguins return to their nests each evening. Pilots Beach is located at the base of the high rocky headland at the end of the Otago Peninsula. The penguin viewing platform here is a large, sturdy structure. No effort was made to camouflage it, but that doesn’t matter. New Zealand’s little blue penguins have been known to nest in building foundations and other developed areas, so a man-made structure doesn’t scare them. And the viewing platform leaves plenty of space for nests and is complemented by man-made nesting boxes. Light is a bigger problem. Some penguins come ashore while it’s still light, so you have a better chance of seeing them. That’s not true for little blue penguins. They generally wait until after sunset – often well after sunset – to come ashore for the night. Because people can’t see the penguins in the dark, a lighting system that doesn’t bother the penguins was developed and installed along the viewing platform. As long as visitors don’t use flashlights, camera flashes, or other lights, the penguins seem oblivious to the lighting situation. Since the penguins won’t appear until the sun sets, it’s already dusk when we are allowed to walk down to the viewing platform. It ends at the viewing platform. There is a seating area on the platform, but – since it is set back quite a bit from the railing – we choose to stand along the railing. We aren’t sure where the penguins will come ashore, so we pick a spot with a good view out to sea. From there we watch seals and seagulls on the beach, all the while scanning the sea for penguins as the sun sets. We’ve been told that the penguins will gather together in groups (called rafts) just off the beach and then swim in together for safety. (Penguins don’t move very fast on land.) And, as the last rays of the sun fade, we see a few heads bobbing in the water off the beach. Apparently they will only wait so long for the rest of the colony to appear, because the first one we see comes ashore alone. Or maybe he’s the scout. At any rate, soon there are groups of two or three. And then we see groups of a dozen or more swirling in the water before coming ashore. Once on the beach, they receive an irritated greeting from sea gulls that seem surprised the penguins once again chose to come ashore here! The penguins have to cross the sandy beach and then climb over piles of rock before reaching the slope where their nests are hidden. Luckily for us, the path to their nests (some of which are actually located underneath the viewing platform) runs right along the edge of platform. We are literally within a foot of these wonderful birds! As they run/waddle past, some hurry along with their head down. Others stop to stretch and preen. As the paths fill with penguins, they stop to call with barks, squeaks, and trills. Somewhere under the viewing platform a fight breaks out, with lots of angry-sounding squawking. I would guess we saw at least 100 little blue penguins during the evening and there were still a few more coming in when we had to leave. That’s a lot, but of course, one can never see enough penguins! Just beyond the city of Dunedin, New Zealand’s Otago Peninsula offers opportunities to see both little blue and yellow-eyed penguins. Dunedin is the largest city in southeast New Zealand and serves as the gateway to the Otago Peninsula. It’s a good base for exploring this part of the South Island. Located on the southeast coast, Dunedin is about 4 ½ hours from Christchurch and 3 ½ hours from Queenstown. The city is well-connected to the rest of New Zealand by relatively good roads. We had a rental car, but a number of bus lines serve the city so a car isn’t essential. Dunedin can also be reached by air from a number of airports within New Zealand. Cruise ships often include a stop in Dunedin. However, the cruise port is about 20 minutes from the city and farther still from the Otago Peninsula. Buses, expensive taxis, and tour companies make it possible to arrange your own tours, but realize it will take at least an hour drive from the cruise terminal to the blue penguin observation area and then another hour to get back again. That’s if there isn’t much traffic. It could be twice that during rush hour, when the neck of the peninsula becomes a major traffic bottleneck. And the time to see the penguins is after dark. So, unless your cruise is staying overnight or at not departing until very late, you won’t be able to see the little blue penguins. 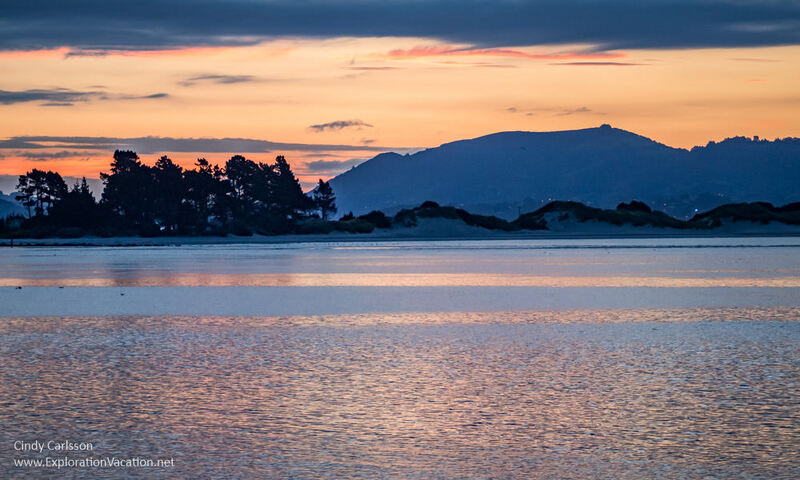 The Otago Peninsula in general – and the penguin colony in particular – is another half-hour or more (a lot more during rush hour) from downtown Dunedin. We stayed right on the Otago Peninsula in an amazing Airbnb and absolutely loved it. There is plenty to do on the peninsula and it’s a really pleasant part of the world with a lovely holiday vibe. It would be a little tricky to stay there if you are relying on buses, but I highly recommend it if you have a vehicle. The only viewing platform for observing little blue penguins is located at the Royal Albatross Centre at the far end of the Otago Peninsula. All tours leave from the Royal Albatross Center. This is a nice facility with a restaurant, a fun gift shop, and a lot of great information on the area’s natural history. Plan to spend some time here learning about the area and the plants, birds, and beasts that call it home. There are a variety of daytime tours available through the Royal Albatross Center. Most focus on albatrosses, as there are very few blue penguins wandering around during the day. The viewing platform for watching the little blue penguins is only available as part of a “tour” with guides that provide information about the penguins, help spot them, and monitor visitor behavior. Group size is limited to 100 and handicapped access is available. Despite the cost (about $25 USD when we visited), evening tours often sell out. Make your reservation in advance to be sure you’ll have a spot. When we visited in November 2017 the best place to view the penguins was along the far side of the viewing platform. (Cross all the way to the opposite side from the main entrance.) Most of the penguins came up from the beach and waddled along that side of the platform before disappearing behind or under it, giving visitors a good view. If you do get a good spot, don’t hog it. After you’ve been there for a while, let someone else have it. Bring an extra layer. The platform is open to the sea and it can get quite chilly once the sun goes down. There is no information on the internet as to the number of penguins in the Pilots Beach colony or whether the numbers vary seasonally. Farther up the coast at Oamaru the number of penguins varies greatly throughout the year, with the highest numbers during the summer. It appears there are penguins all year at Pilots Beach, but if it is important that you see a lot of penguins, ask how many they’ve been seeing before making a reservation. Overall, New Zealand’s population of little blue penguins is declining. However, despite what seems like a lot of infrastructure, this colony is healthy and growing. The trust that manages the site also monitors the birds, provides nest boxes, and is working to restore the degraded landscape around the beach. (These activities are partially funded by your tour fee.) And, while the viewing platform seems big, it keeps humans away from the birds and their nests and is only open to visitors for a few hours in the evening. In other words, it is far less damaging than the previously unmanaged visits to the beach by tourists and their dogs! True penguin fanatics may be able to see both yellow-eyed and little blue penguins in one night. While the two species don’t nest together (yellow-eyed penguins value their privacy), both species nest in around the Otago Peninsula. Because yellow-eyed penguins begin to return to their nests before dark, it’s possible to see them at Penguin Place and then hop over to the Royal Albatross Centre to see the little blue penguins come in. During the summer you’ll even have time to get a bite to eat at the Albatross Center before going down to see the little blues. Yellow-eyed penguins are extremely rare and their population has declined precipitously in recent years, so you may not get a chance to see them even if you take a tour. But they are very cool and very different from the little blues. 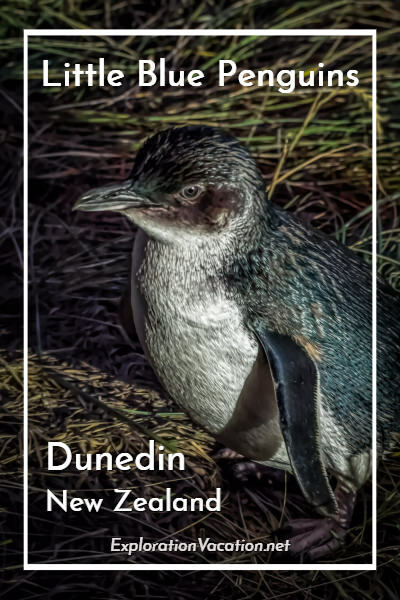 Besides the Dunedin area, New Zealand’s blue penguins can be found at a number of South Island beaches in the Marlborough Sounds, Akaroa Harbor, Oamaru, and Stewart Island. There is also another observation facility north of Dunedin at the Blue Penguin Colony in Oamaru. Unlike the Pilots Beach colony, visitors observing the Oamaru penguins must remain seated and photography is prohibited. Love little blue penguins! I never ended up seeing any in the wild when I was in New Zealand, because it was too cold when I was there to want to sit on a beach at night. I did see some being fed at the Antarctic Centre in Christchurch though (and wombats in the wild in Australia, which was one of the highlights of the trip)! I have not seen wombats, but I think they would be really cool to see. You need to go to South Africa – the penguins outside Cape Town are bigger than the little blues, but the beach is nice and warm so it is easy and comfortable to watch them! The same experience we had at Philips Island off Melbourne. But you were able to take photos??? Probably because they have that special lighting! Yes, they allow photos, but no flash – not even the little seeker light that most cameras have to help them focus. They asked everyone to turn that focus light off or not use their camera if they couldn’t or didn’t know how to turn it off. And they watched closely. I think there are more in Melbourne, but generally the same thing. They’re so cute! I have seen little blue penguins in Australia many times. Watching these timid little creatures is just magical. Yes, they are adorable and I’d love to get to Australia to see them there too! How sweet the little blue penguins are! Just one more reason for me to head to New Zealand! Yes, and there are so many reasons to head to New Zealand! The penguins are adorable. What a thrill for you to see them and experience them. I had never heard of the blue penguin. What a great big wonderful world we live in!! You are absolutely correct, Marilyn, we live in a great big wonderful world! I’ve been to New Zealand last year but I missed seeing the little blue penguins, Cindy! They are so astonishing. The wait seems like lots of fun and an unforgettable experience!